In the 1920s, several US watch companies produced "glow in the dark" dials painted with radio-luminescent paint, composed of zinc sulfide (ZnS) mixed with radioactive radium (226Ra) salts. The employees hired to paint the dials were mostly young women. The paint was applied to the numerals with a small brush: as the brush became flattened, the women "pointed" the brushes on their tongues between applications, and thereby ingested a small quantity of radium each time. Radium is an alpha-particle emitter that is chemically similar to calcium, and is therefore a 'bone seeker'. Once ingested, 226Ra accumulates in the long bones, irradiates osteoblasts and other nearby cells in the bone marrow with high-energy, short-distance alpha radiation, and produces bone cancer and other genetic damage. The graph shows that the incidence of bone cancer increases with an increasing "body burden" of 226Ra. [For more information, see "The Radium Girls"]. 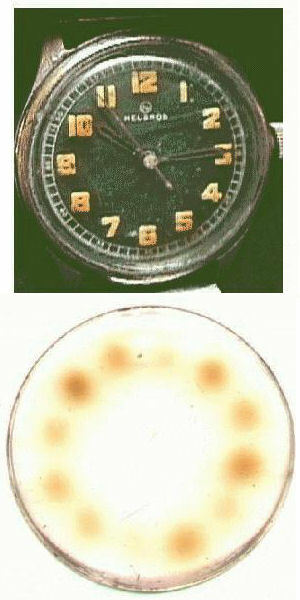 Radioactive dials found wide use in military aircraft in World War II, and radium watches were manufactured into the 1950s [right]. Modern photo-luminescent watches are light-activated, and do not use radioactive material.